When purchasing a live tree, choose a tree with fresh green needles that do not fall off when touched. When purchasing an artificial tree, look for the label that reads, “fire resistant.” Although this label does not mean the tree won’t catch fire, it does indicate the tree will resist burning and should extinguish quickly. When setting up a tree at home, place it away from any heat source, such as a fire place, radiator, heat vent or lights. Cut 2″ from the base of the live tree before placing it on the stand. Make sure your Christmas tree is not blocking any exits. Keep the tree stand filled with water so the tree does not dry out quickly. Dry trees can be a serous fire hazard. Make sure the tree is away from any heat source, such as a fireplace, radiator, heat vent, candle or lights. Replace any string lights with worn or broken cords. Check for broken or cracked sockets, frayed or bare wires or loose connections. Use no more than three standard-size set of lights per single extension cord. Read manufacturer’s instructions for number of LED strands to connect. Always turn off tree lights before going to bed or when you leave the house. After Christmas,get rid of the tree after Christmas or when it is dry. Dried out trees are a fire danger and should not be left in the home or garage or placed outside against the home. Bring outdoor electrical lights inside after the holidays to prevent hazards and make them last longer. 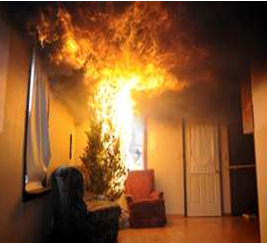 Although Christmas tree fires are not common, when they do occur, they are more likely to be very serious. Play it safe, call 9-1-1 immediately if your tree is on fire!